Most asphalt and construction jobs require reliable dump trucks. Without a working dump truck, a project can take longer than estimated. Cactus Transport by Cactus Asphalt eliminates this risk by providing reliable dump truck transport to your job site 24/7 in Phoenix, AZ. We have a fleet of dependable 10-wheeler and 16-wheeler dump trucks capable of carrying asphalt materials to and from a worksite. We employ highly trained drivers and keep our trucks maintained so that you can rely on their operation for the duration of your project. 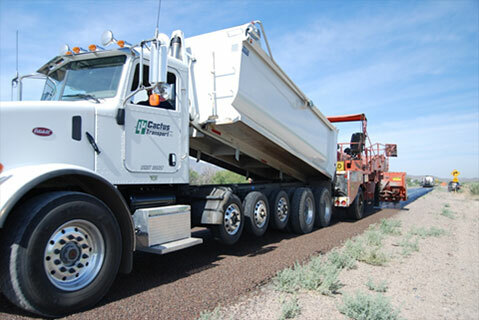 Cactus Transport has more than three decades of experience in the asphalt industry providing crucial transport services for asphalt construction companies like yours. This unique blend of experience, expertise, and versatility has allowed us to become one of the Southwest’s most trusted transport companies. Call to learn more. Cactus Transport dump trucks are cleaned and serviced regularly to prevent debris buildup and engine strain. You’ll always be able to rely on them to handle the stress of any asphalt transport job. Our trucks can also deliver various raw materials, ranging from hot asphalt cement to asphalt aggregate for use in a roadway or other resurfacing project. Our trucks range in size from 10-wheelers to 16-wheelers and come equipped with a high-quality hydraulic dump mechanism. However, a truck is often only as good as the person using it. Cactus Transport’s background-checked expert drivers and operators can transport and handle tankers, CRC spreaders, and other equipment. Our operators are also trained to safely transport laydown machines to your asphalt surface work site. The machines available from Cactus Transport are regularly serviced and maintenance to ensure dependable operation throughout the project at hand. 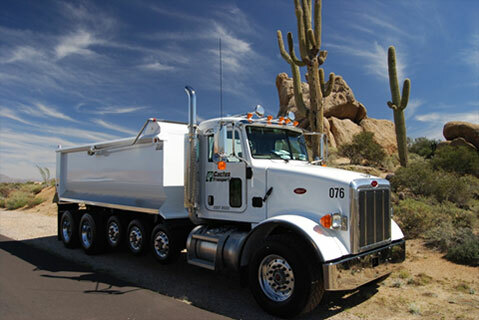 Cactus Transport by Cactus Asphalt offers reliable dump truck delivery in addition to our other asphalt transportation services. For your project, we can deliver raw materials and application and excavation equipment to your job site. Then, when it’s time to apply sealing coats, we offer both the materials and spreader machines to get the job done right. We can also handle extraction and removal of hazardous materials that may be byproducts of any part of the process. Trust our mix of experience and versatility the next time a client calls on you for an asphalt job large or small in Phoenix, AZ. Contact us to learn more! Call (602) 616-5088 for more information!